Cultivated for food, the plant sends up its large flowering stems before the leaves are produced. 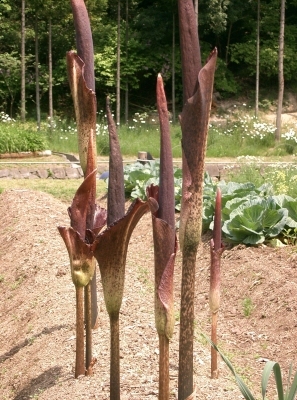 Flower spathe cut open to reveal male flowers (towards the top) and female flowers near the base. Aroids: Plants of the Arum Family. An excellent treatment of the family Araceae, giving lots of information about the plants, how to grow them, their uses etc. I found it a bit disordered - if you want all the information on a specific species you have to trawl through the whole book. E. Asia - southwest China. ]. When large enough to handle, prick the seedlings out into individual pots and grow them on untill large enough to plant out.